5/13 Cup of Coffee: Portland and Salem both took home wins thanks to a pair of solid pitching performances from Keith Couch and Matt Kent. The Drive brought their bats on Thursday, pounding out nine runs on 14 hits on a big night for Josh Ockimey. In a bit of a flip-flop in the rotation, Roenis Elias got the start on Thursday for the PawSox instead of William Cuevas, who was bumped back a day. Elias' night began inauspiciously, giving up a leadoff home run. He was roughed up over four innings, allowing five runs on 11 hits while walking two and striking out two. The PawSox briefly took a 3-1 lead in the second inning when Chris Marrero and Blake Swihart scored on a ground out and an error on the same play and Sandy Leon drove in a run. That was about all the bats could muster, however, as the PawSox ran themselves out of a rally in the fifth and grounded into a double play in the seventh. Sam Travis and Rusney Castillo each went 1 for 4. In his first start since being sent down to Double-A, Keith Couch hurled six-plus shutout innings against the B-Mets. He scattered six hits in his outing, striking out five and walking one. He allowed four hits and stranded three runners in scoring position in the first six innings. He was lifted after allowing back-to-back singles to start the seventh. Chandler Shepherd worked out of the jam and provided two innings of shutout relief. Nate Freiman went 2 for 4 with a pair of doubles and three RBI. After a rough night on Wednesday, Yoan Moncada bounced back on Thursday, reaching base four times. He went 2 for 2 with a pair of walks, an RBI, and two stolen bases to raise his season total to 21. Mauricio Dubon drove in the go-ahead runs in the fifth on a two-run double. Andrew Benintendi had a rare hitless night, going 0 for 4. Matt Kent went six strong innings on the mound, allowing just one run on two hits while striking out five and walking one. Ben Taylor picked up the save with three scoreless innings of relief. He allowed just one hit and struck out five. It was a big night at the plate for Josh Ockimey who belted his seventh home run of the season on a two-run shot in the first inning. The big first baseman went 2 for 4 with four RBI on the night, adding a double and a run scored. Kyri Washington drove in a pair right behind Ockimey, going 2 for 4 with a double. Luis Alexander Basabe drilled a solo shot in the fourth inning - his fourth of the season - for what turned out to be the winning run. Tate Matheny added three singles and an RBI on a 3-for-5 night. Roniel Raudes flew through his first three innings but then gave up an RBI single and a three-run homer in the fourth. That cut the Greenville lead to just one at the time, but Raudes ended up getting the last five outs of his outing via strikeout. He finished with eight strikeouts on the night, allowing four earned runs on five hits and a walk. 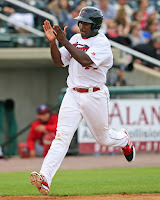 Player of the Night: 2014 fifth-round draft pick Josh Ockimey continues to impress this season at Low-A Greenville. On a bit of a mini-hot streak, the 6-foot-1 left-handed batter has homered in two of his last three games and has driven in eight in that span. He is now hitting .303 on the season with an OPS over 1.000.